In addition to war and the Slovak National Uprising, two other themes dominated the storylines of Slovak feature films during the post-war period. One of these was represented by contemporary ‘Awakening’ films and ‘social dramas’ with a distinctive propaganda orientation and emphasis on the process of creating a ‘new society’ and also on the hard life of the individual under the previous regime. The first such film was Priehrada (‘Dam’, 1950), directed by Paľo Bielik, in which the construction of a dam was not only a metaphor for progress but also the cause of the disappearance of the old world with its individual social traditions and values. Thanks to Paľo Bielik’s experience, this film at least in part preserved the individualising manner of depicting characters and relations and was not fully bound to the ideological agitation and propaganda model – despite the political-ideological supervision of the Communist Party which pervaded Slovak film production to varying degrees right up to 1989. Many feature films of the 1950s found themselves fully in the role of agitation or ideological vehicles of the period, but a few succeeded in overcoming the interpretation schematism of ‘socialist realism’, offering at least a partial dramatisation of the characters and issues and not just a simplistic view of the previous historical period. 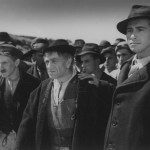 The film Pole neorané (‘The Unploughed Field’, 1953) based on the novel by Peter Jilemnický and the screenplay by Vladimír Mináč and directed by Vladimír Bahna, is a good example. A social drama about the economic crisis of the 1930s, the film depicted several social contexts (emigration, rural poverty, economic oppression) through distinctive dramatic characters and relationships. Bahna’s film also introduced what would be one of the most significant elements in the Slovak feature film during the entire post-war period – the connection with literature. Slovak literature played a significant role in the development of Slovak feature films for most of the second half of the twentieth century, especially during the early period of feature film development when professional scriptwriting was in its infancy. Like Pole neorané, Paľo Bielik’s Štyridsaťštyri (‘The 44 Mutineers’, 1957), a historical drama set during World War I which recounts the uprising of Slovak soldiers in Kragujevac, is one of the group of films that are not affected by the period’s interpretation of reality. Bielik succeeded in building an almost classical drama with strong characters who are powerfully depicted through the use of metaphorical images and the dynamic depiction of combat on the front line.